Move oven rack to lowest position. Heat oven to 450ºF. Spray 12-inch pizza pan with nonstick cooking spray. In large bowl, stir Bisquick mix, very hot water and oil with fork until soft dough forms; beat vigorously 20 strokes. Let stand 8 minutes. press dough in bottom and 1 inch over side of pizza pan. Lightly press 1/4 cup of the pepperoni along edge of dough. Place string cheese over pepperoni along edge of dough, overlapping if necessary. Fold 1-inch edge of dough over and around cheese and pepperoni; press to seal. Bake 7 minutes. Spread pizza sauce over partially baked crust. 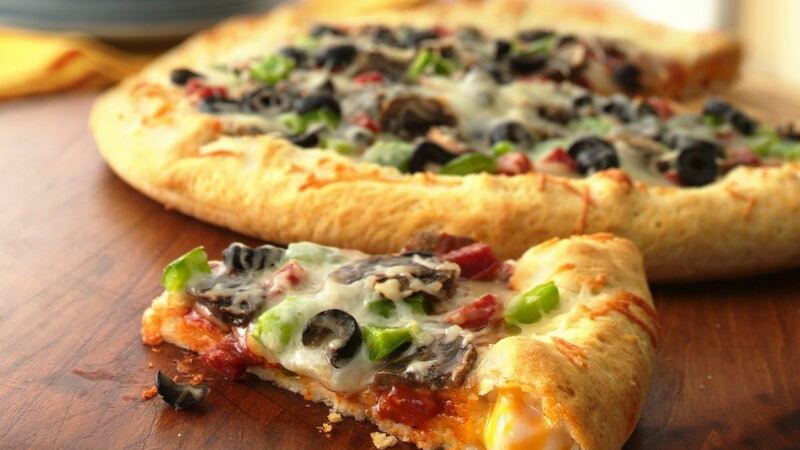 Sprinkle with 1 cup of the Italian cheese, remaining 1/2 cup pepperoni, the mushrooms, pepper and olives. Sprinkle with remaining 1 cup cheese. Bake 9 to 12 minutes longer or until crust is golden brown and cheese is melted. Substitution: If you can't find the Italian cheese blend, shredded mozzarella cheese is a great substitute. Variation: Leave off the pepperoni for a vegetable lover's pizza.